A little over a year ago, they announced with fanfare that Lyon would be losing two of its stars. Jean-Paul Lacombe had put Léon de Lyon up for sale. A few months went by, and the buzz was that the 40 cover luxury restaurant would undergo a transformation into a 150 cover Brasserie and remain in his hands. He decided not to sell after all. The last low key luxury service took place on New Years eve, and at the dawn of 2008, they rolled up the red carpet and work began on the new place. They kept the pretty bones, the 18th century parquet floor, the woodwork and stained glass. They installed a revolving glass door at the entry, and completely changed the rest, turning it into a restaurant for the people. Indeed, at a restaurant that used to be booked for months in advance and reserved for those that could afford to drop several hundred on a meal for two, we now we see a entree-plat-dessert for €22, with a nice selection of wines by the glass or bottle, on par with the other cafés and bistros in the neighborhood. The original cave is still in tact, with these wines offered at a 25% discount from original prices, a nice touch. Local response to this has been calm and collected. Everyone who cares knows that Jean Paul Lacombe has been running a number of smaller bistros throughout town for years, even if he regularly spent 90% of his time in the kitchen at Léon de Lyon meticulously maintaining his Michelin stars. These are quiet bistros along pedestrian streets popular with the tourists, rue Mercier, rue des Marroniers, as well as some out of the way places with steady year round clientèle. One up in Caluire along the Rhone in a working neighborhood, another up on the Croix Rousse hill near Croix Pacquet, one by the Palais de Justice (see Marché Guichard). In all he claims a total of 15,500 square feet (1400 sq. meters) of restaurant space in town, serving all of the regular bistro food. These places are low key, the kind of place you might have lunch with colleagues, or go to dinner with a mind for good French service, classic fare and local wine. There's something to be said for a good meal with no surprises. Maybe a little whisper and passing of business cards, but certainly not a lot of guests on food pilgrimages. No starry-eyed foodies snapping photos of every course. Lacombe was quite successful at keeping the media din at a minimum. Neighborhood places that feature clean tablecloths, a little bit of the coddling in the style of les Meres Lyonnais for the businessmen, finishing with a demi Saint Marcellin or some cervelle de canuts, approachable and comfortable but not tea-house cozy. Dependable. Dependable. 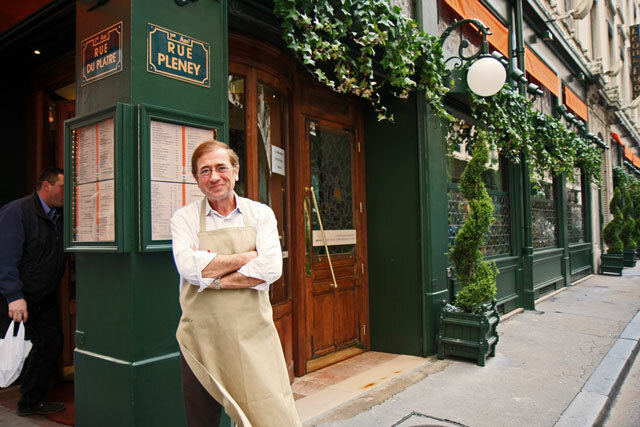 This is what Lyon was built on, and this is what Jean-Paul Lacombe reasons is what makes Lyon a great place to eat, for everyone. 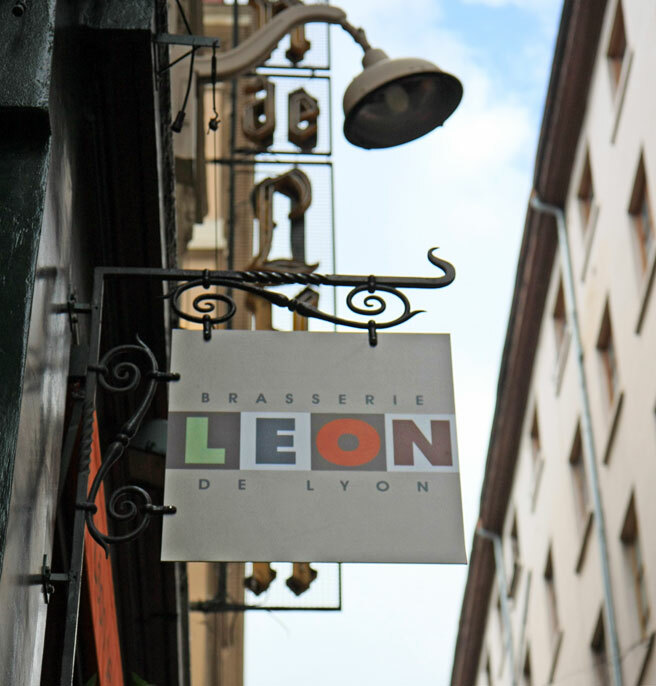 In an interview with Lyon Capitale: "In Lyon, the young chefs here perhaps show less creativity than elsewhere, but it's because the city doesn't expect that. The people of Lyon are not looking to be fed with a syringe. One is never very good when they copy what's going on in the neighbors' kitchens. Here in Lyon, we maintain our own personality." And opening a 150 cover brasserie is something that falls in line with JP Lacombe's personality. The man is a restauranteur, through and through. He knows how to lead. The consummate chef. The people of Lyon appreciate the fact that he is giving back in this way. So what was for lunch at Léon de Lyon today? Well, in addition to a surprising amount of elbow room and lovely acoustics, there was a gracious welcome. First they brought out an amuse of a little pot of a mixed olive tapenade to enjoy with the bread at the table. There were about 20 dishes you could order a la carte starting at €10.90 for the oeufs en cocotte and main dishes averaging in the low 20s. I decided on the entree-plat-dessert du jour. A cold Vichycoisse came with an oblong creamy smoked salmon tartine tucked along the side of the bowl. Then came the stuffed rabbit. An entire deboned saddle and haunch. Really, enough for two. It was enormous. The forcemeat was flavored very nicely with rosemary. It was quite beautiful and served over a bed of risotto-style wheat grains, spread over a savory meat jus-infused apricot and citrus coulis. In a word, inspiring. If I wasn't assured otherwise, I would also say creative. I wish I knew how to make this at home. The chilled caramel cream was portioned like a quenelle and drizzled with caramel sauce, topped with a beautifully crisp sweetened feuilleté twist. The chef/owner's presence was clear at the restaurant during lunch service today. He came through several times, wearing casual attire, draped in a crisp beige apron, looking very much at home and full of smiles. By the time I paid my bill, he was seated three tables down from me, listening attentively to another guest who had latched onto his arm. I honestly didn't expect to see this superstar of Lyonnais cuisine on the floor, and much more surprised when he took my hand in his and warmly asked if my meal was alright. I'd figured that would understandably leave things to his carefully chosen staff of 15, and he'd be out playing a round of golf. Perhaps after 35 years of working full time in the kitchen at Léon de Lyon, Jean-Paul Lacombe can't quite bring himself to take any time away just yet. In any case, lunch today exceeded my expectations. Give this brasserie a try and let me know what you think. "The people of Lyon are not looking to be fed with a syringe." What a great quote. Sounds like he's got his priorities straight, and it's working for him. And you! Ooh, this could be just what I'm looking for! Thanks again for your wonderful blog. But I must ask, is it impolite to take pictures of the food served to you in a restaurant? Everyone back home knows what the Eiffel Tower looks like, but they have no idea as to the beautiful food served in France. About photos in restaurants, Keith, There is a time and place for everything. No one can really say if it is polite or impolite, because it always depends on the circumstances. There are some restaurants where people might be taking more photos of the food, especially if it is the kind of restaurant that you built up a lot of expectation for, and if you want to remember or share the experience. In my opinion there is nothing wrong with taking photos in restaurants. Thanks Lucy! I have come to rely on your blog for GREAT pictures of food... Simple inspiration!! There is Nothing wrong with taking pictures in a restaurant, of your dinner or of your friends/family... or both! I am so glad to find this blog and these comments. I love JeanPaul and Fabienne, and am looking forward to a meal there in October, when I return to France. A fine review. The late great Jane Grigson wrote, "We have more than enough masterpieces. What we need is a better standard of ordinariness." I am coming back to this post after a few years, and see that the quality and standard here has not diminished in any way. There is nothing ordinary about this place, it is where I send my friends for a good quality bistrot meal, and a place I take my family for example, for Sunday lunch.